Una excursión de un día al Parque Nacional Lake Mburo es perfecta para los visitantes que desean probar la vida silvestre de Uganda en un solo día. 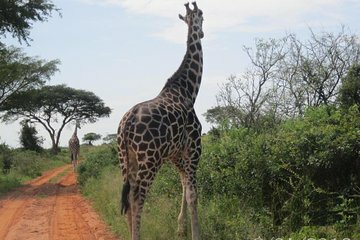 Este tour lo lleva directamente desde su hotel de Kampala al parque para un safari en bote, una caminata guiada y un recorrido de juego, que ofrece tres formas de ver animales como jirafas, hipopótamos y más en la naturaleza. Tres experiencias incluidas en un tour por un valor increíble. Incluye transporte y almuerzo para una salida sin problemas. I had only a few days to spare after a conference, hence a day trip was perfect to see a bit of this beautiful country. I was very worried about travelling alone, but my guide/driver Ahmed rapidly reassured me and made me feel very comfortable. I was picked up at 6 AM from my hotel and we drove for 3h to the first stop at the Equator for photos and a drink. Ahmed was very knowledgeable about the history and wildlife of Uganda. When we arrived at the National Park a big group of Impalas was ready to welcome us, shortly followed by an incredible number of zebras and all kinds of birds. After a game drive that I'll never forget, we stopped for lunch next to the lake, where a curious hippo was showing off for us to photograph. The tour includes a boat ride of 1.5 hours that allows seeing all kinds of colourful birds, hippos and even crocodiles! The final part of the day is a 1-2 hour walk in the Sabana with an incredibly knowledgeable guide, Sam. He can recognise birds by their song and carries a book and binoculars to answer all questions. It's unreal to walk among zebras. On our way back we someone told us the giraffes weren't so far away so Ahmed kindly offered to drive me there, and we found them! 7 spectacular giraffes no more than a few metres away from us! I totally recommend this tour to everyone going to Uganda! I do recommend to take plenty of water it's very hot and something in case of strangely cold weather the morning was quite cold. Also, the drive back was a bit though entering Kampala because of the traffic -apparently that can be avoided staying in Entebbe instead.